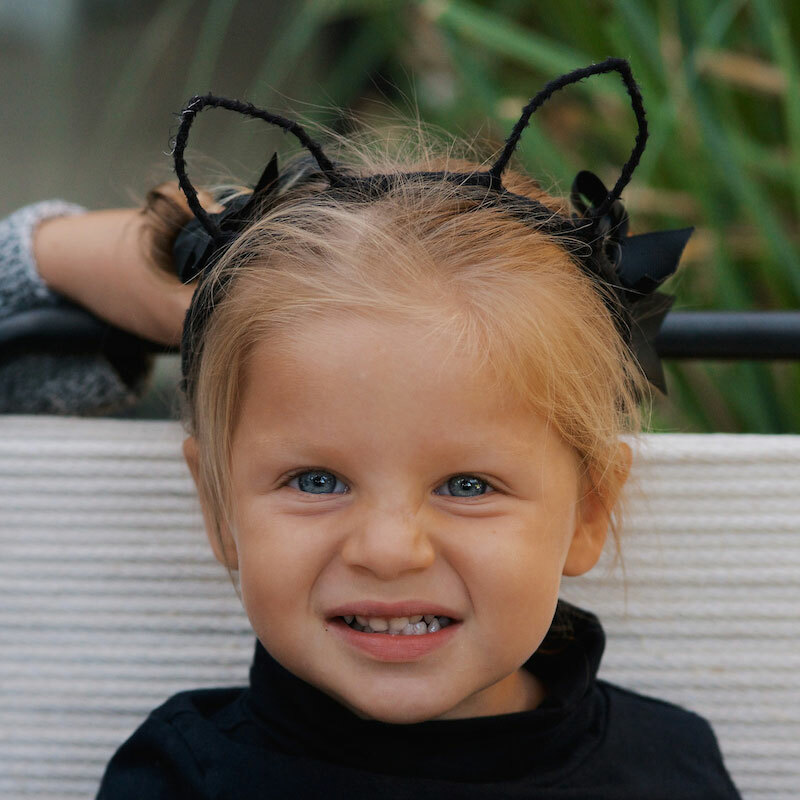 The Halloween get-together that the wonderful Amy Blessing and I threw for the kids last year was so great that we had to make it a tradition. 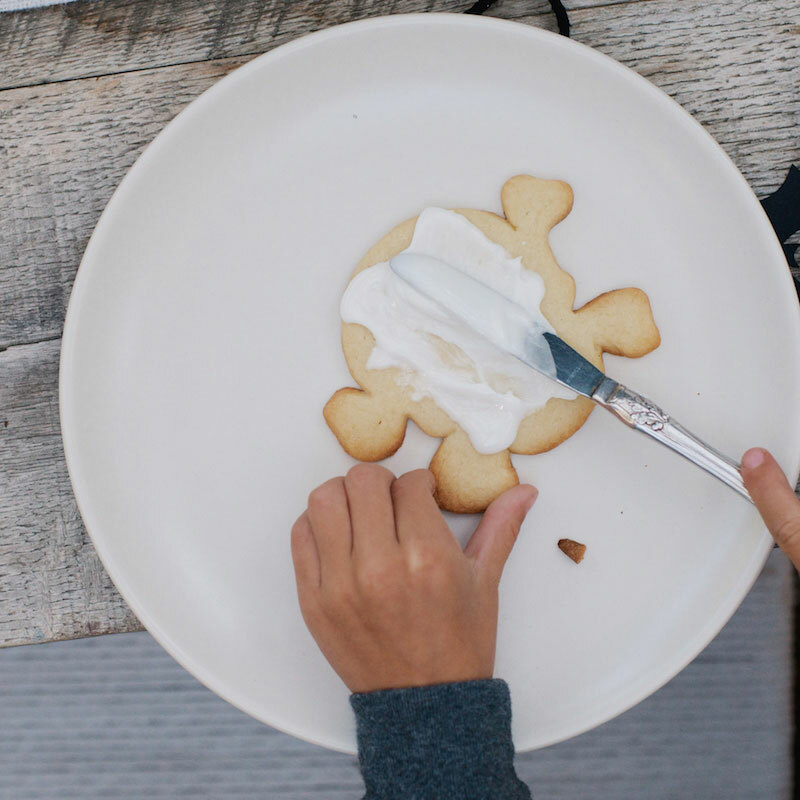 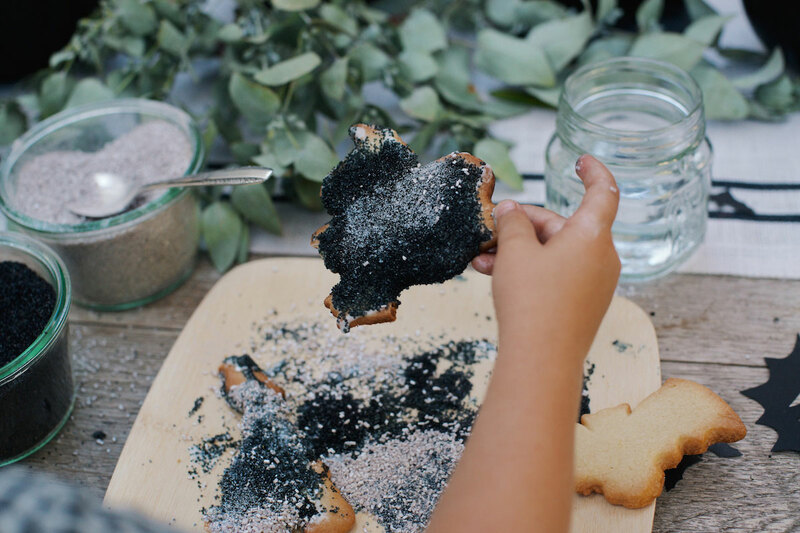 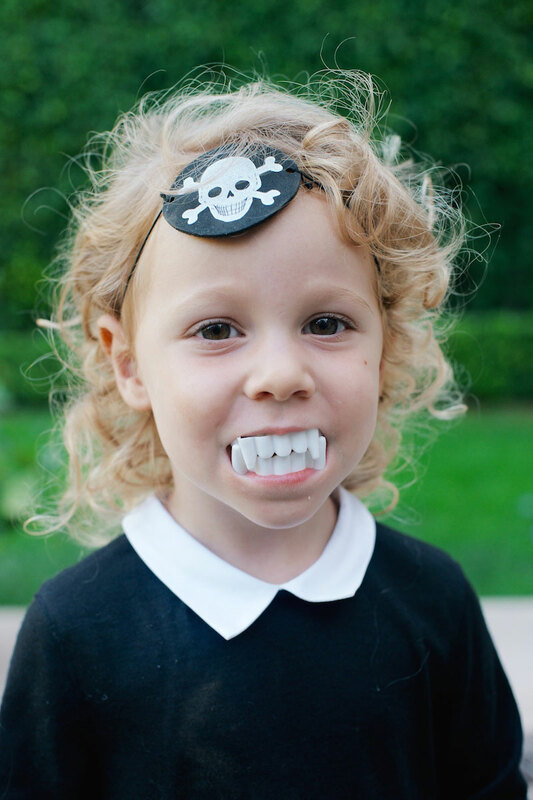 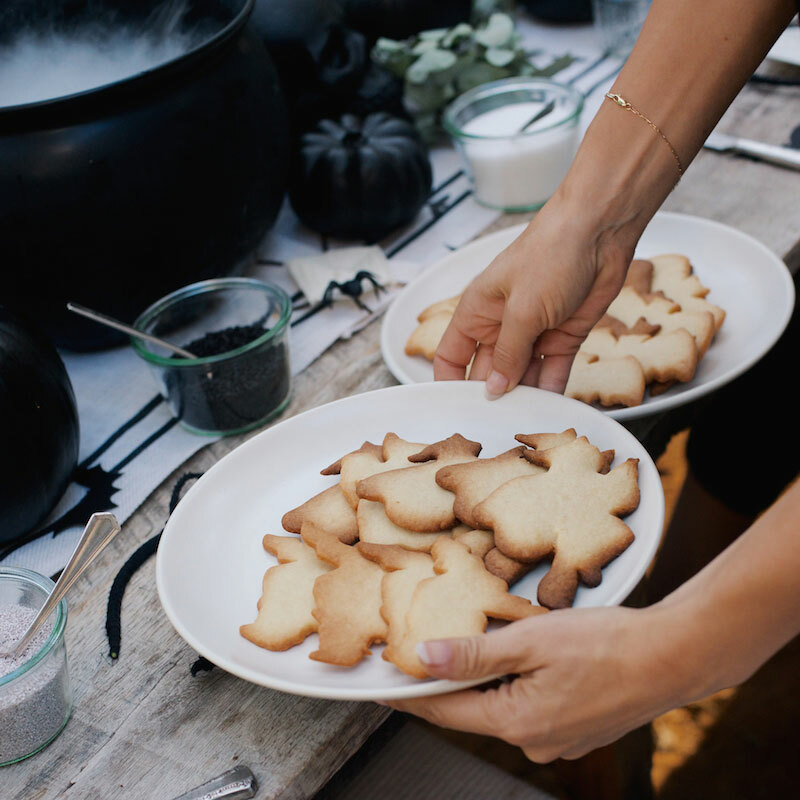 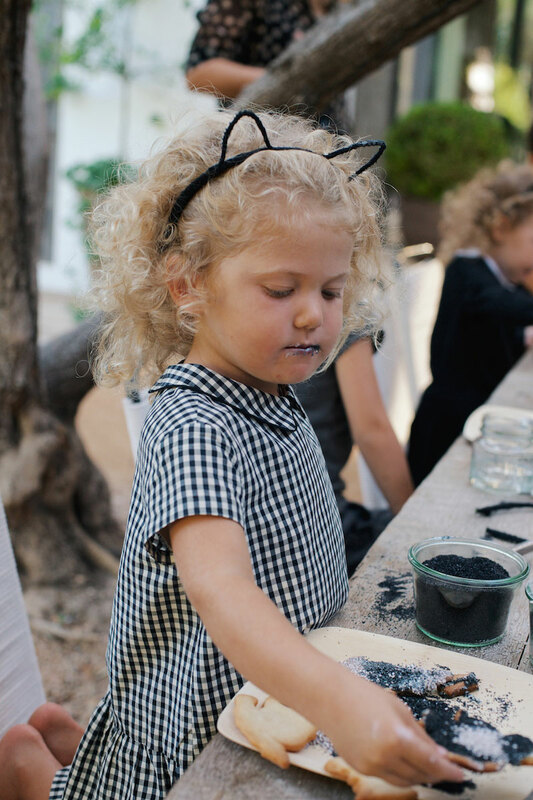 And like last year, the afternoon was just perfect – filled with festive and imaginative tricks and treats, and such fun for all of the little ones in attendance. 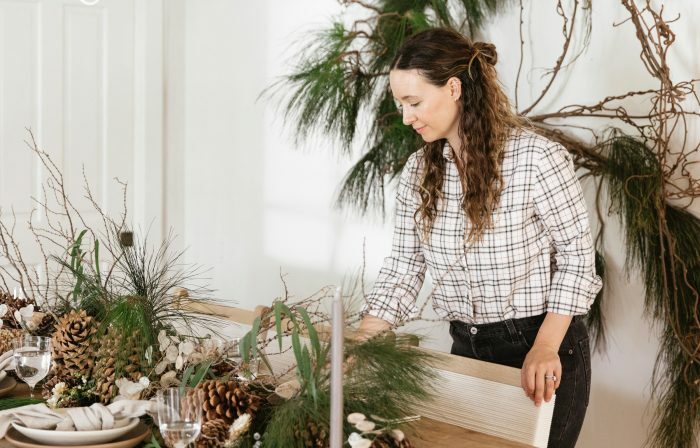 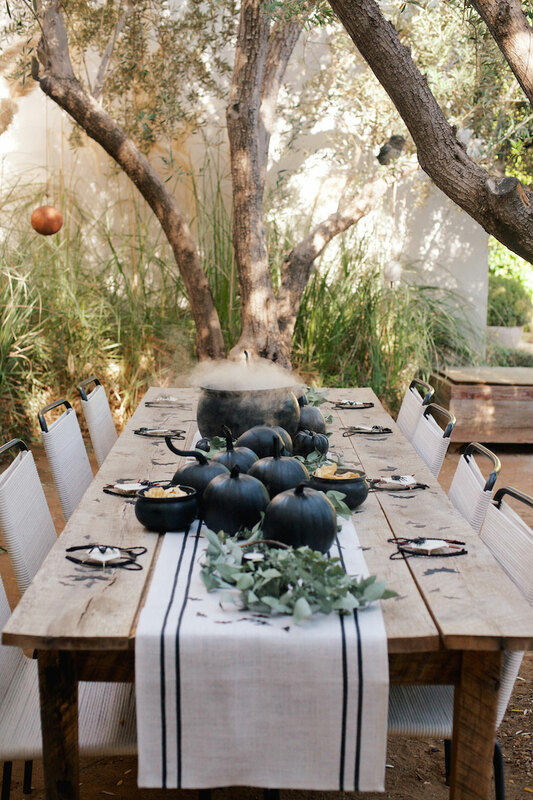 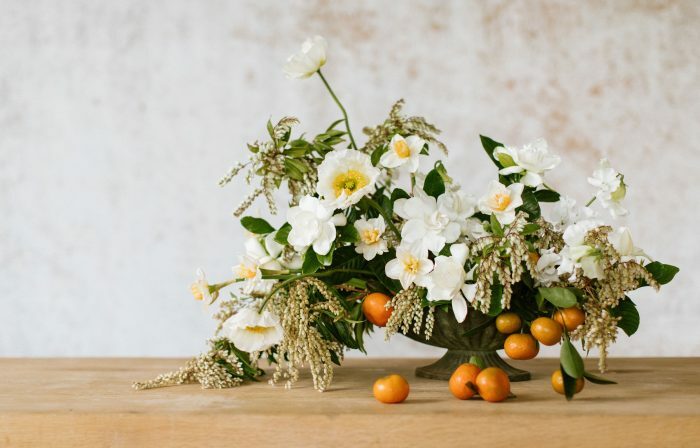 To set the scene, we began by placing a natural fiber runner with black stripes down the center of the table, and on top, a multitude of black skulls from Joan’s and white pumpkins that Tanner and I spray-painted black. 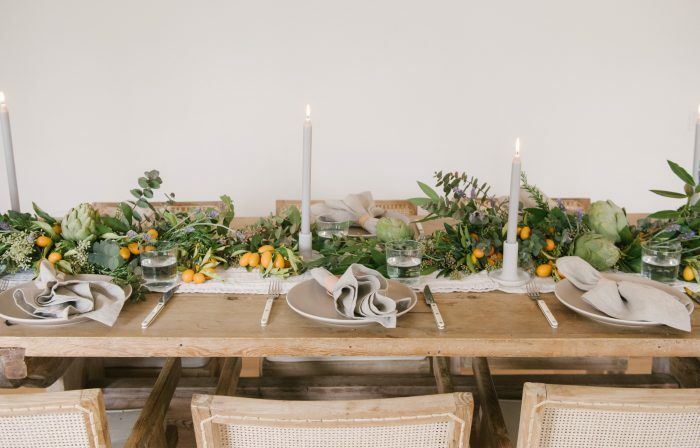 Also down the center of the table, I placed several of my favorite Sakai cast iron candle holders, which we sell at my Montecito store. 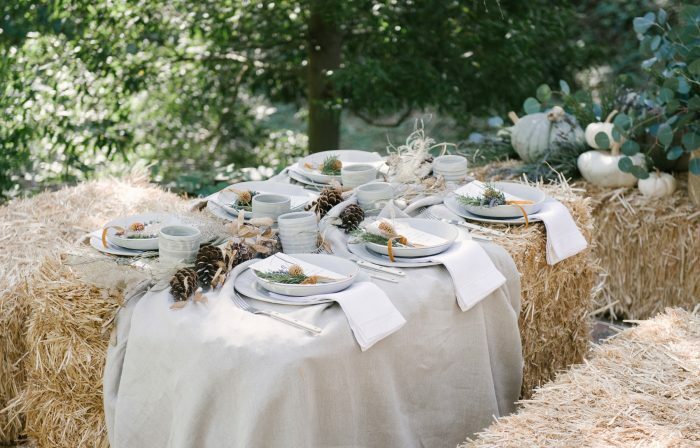 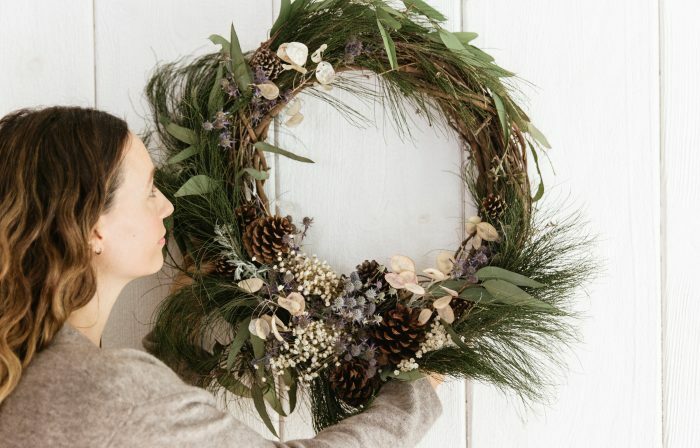 * And around the pumpkins and skulls, we wove a eucalyptus garland that Maurice of Bloom & Plume made just for the occasion. 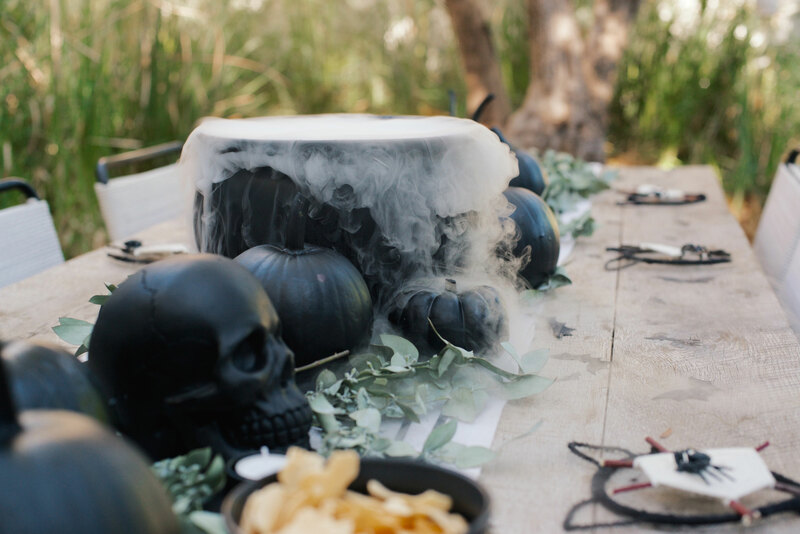 As the spooky centerpiece, we used a large cauldron filled with dry ice, which the kids just loved. 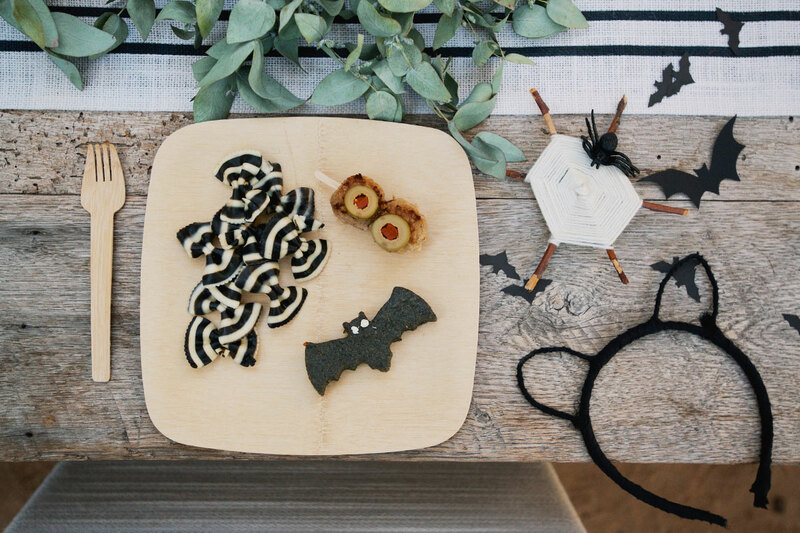 I also placed several smaller cauldrons down the center of the table and filled them with ghost-shaped “Boo Chips” that I picked up at Whole Foods. 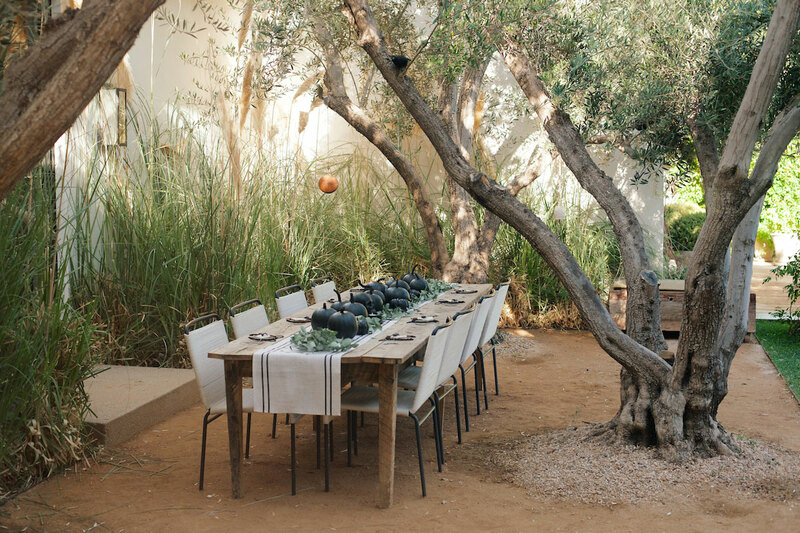 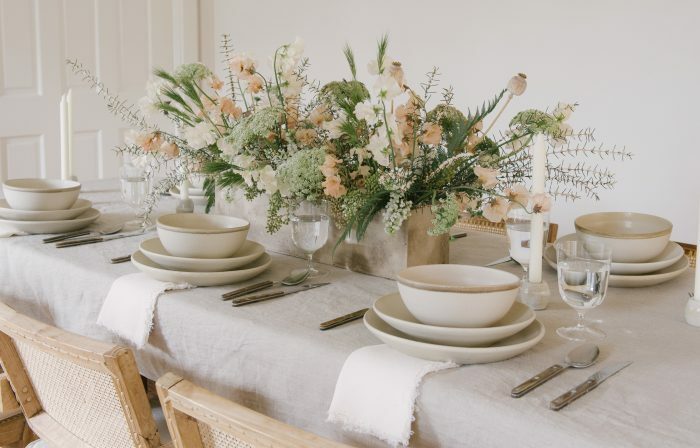 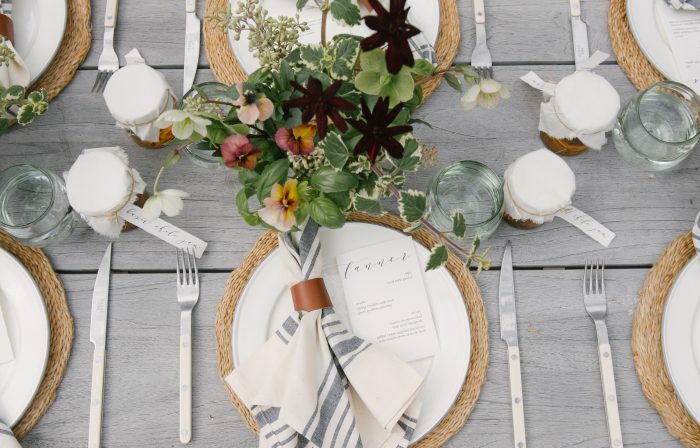 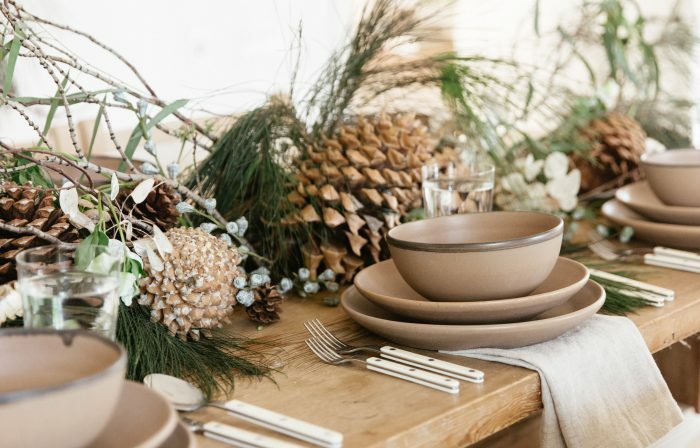 For place settings, we used my easy and chic go-to bamboo plates and cutlery. 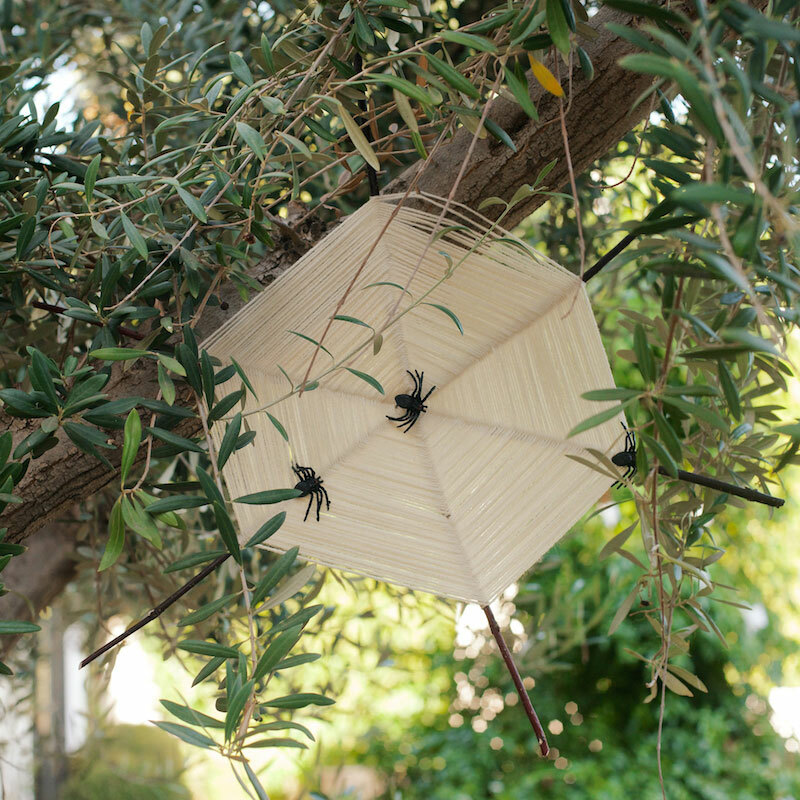 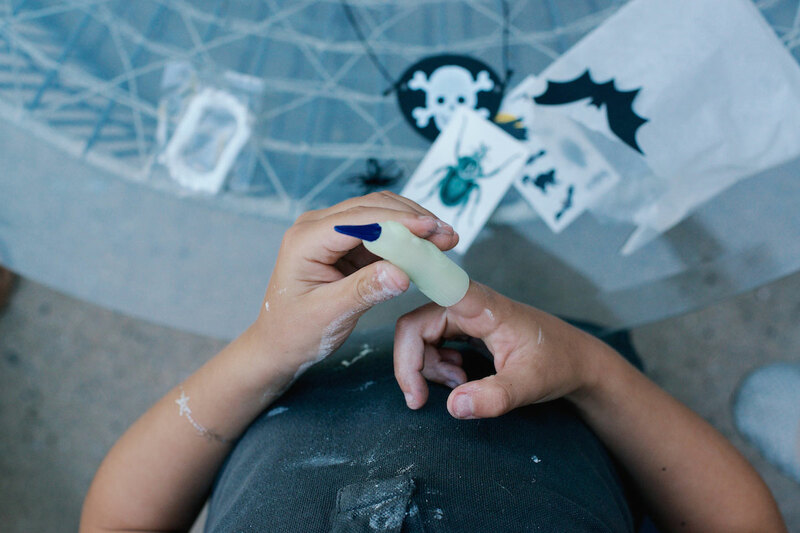 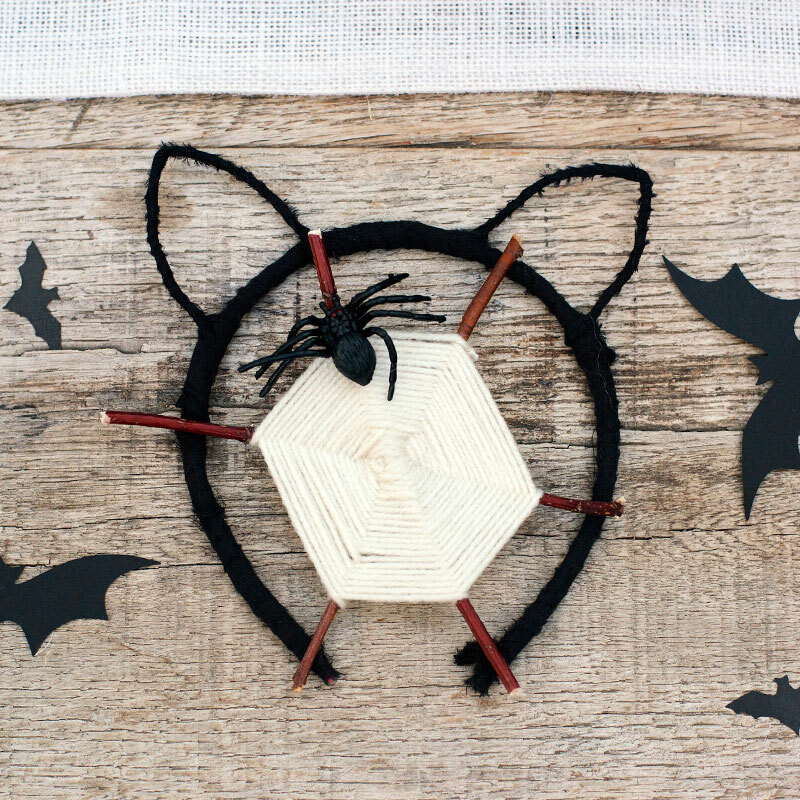 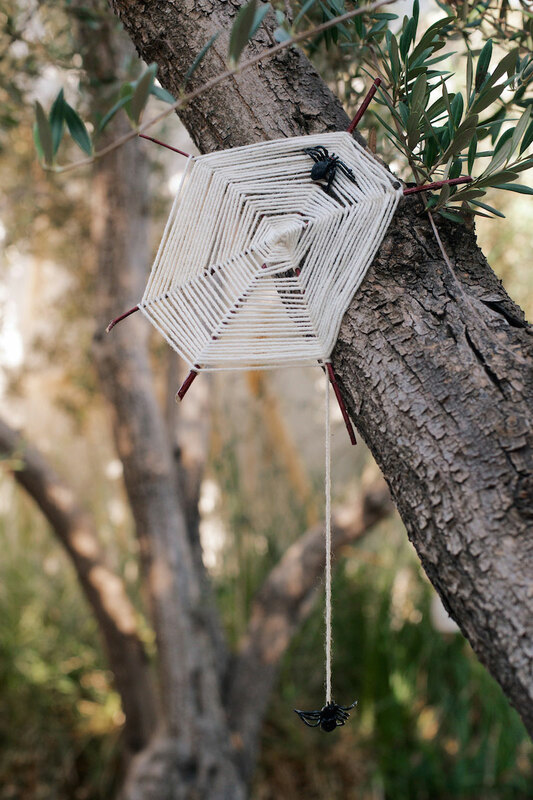 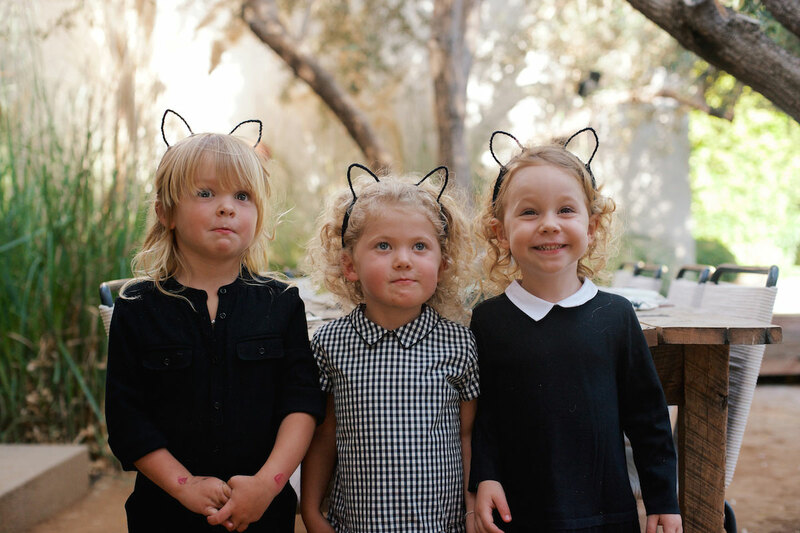 At each, we placed the most adorable yarn and stick spider webs, which I made using these DIY instructions, as well as a sprinkling of paper bats (similar to these) and cat ears that Amy had made for the little party goers, who were all dressed in black. 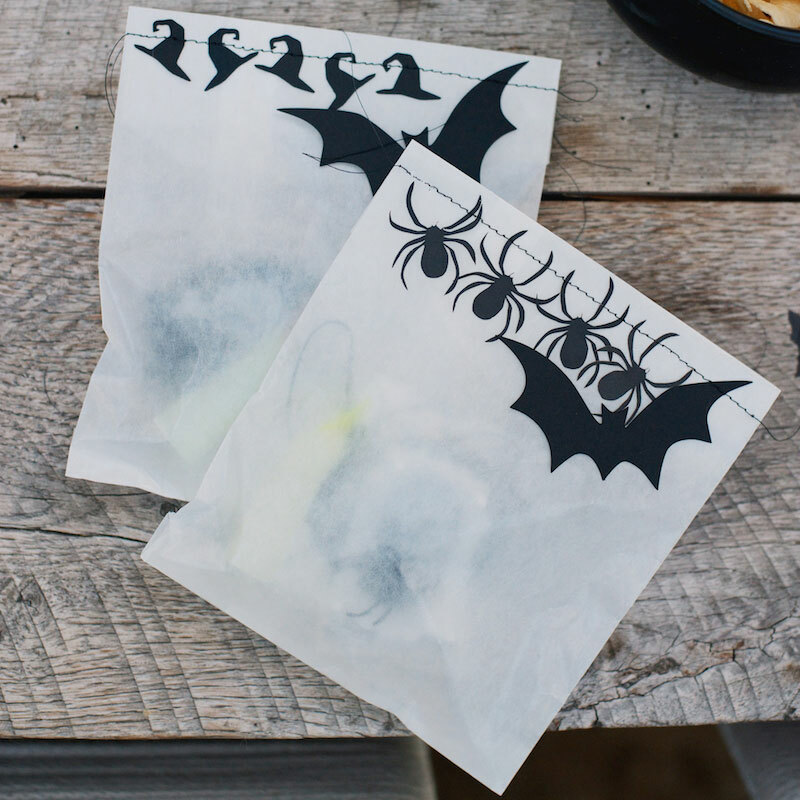 And lastly: the most incredible goodie bags, which Amy put together, complete with eye patches and plastic vampire teeth. 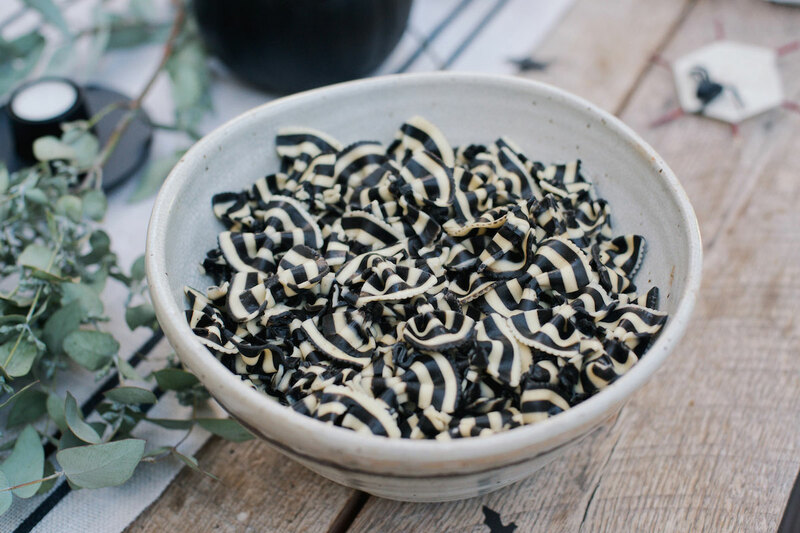 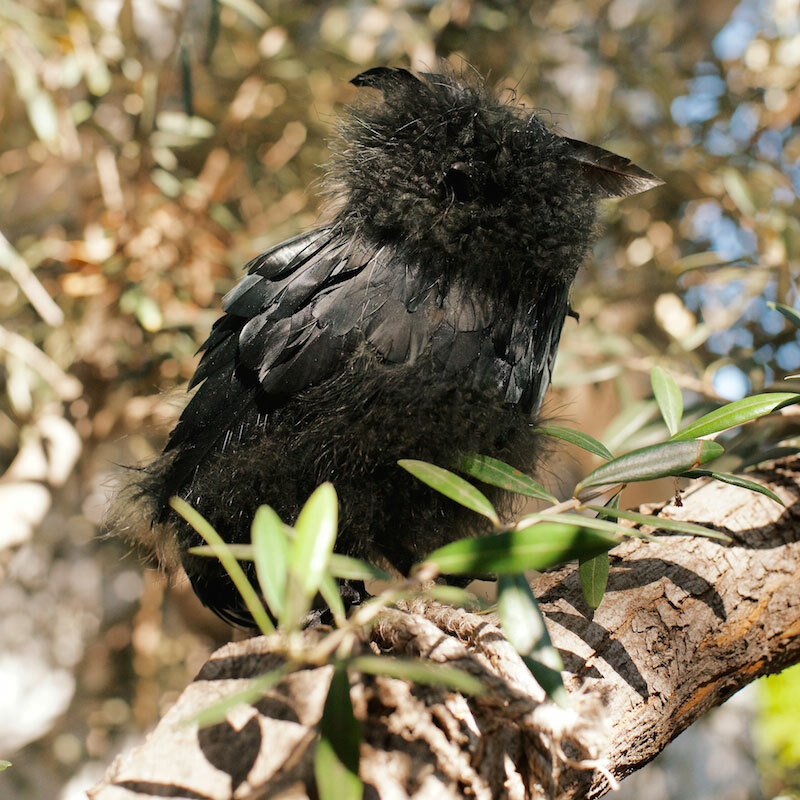 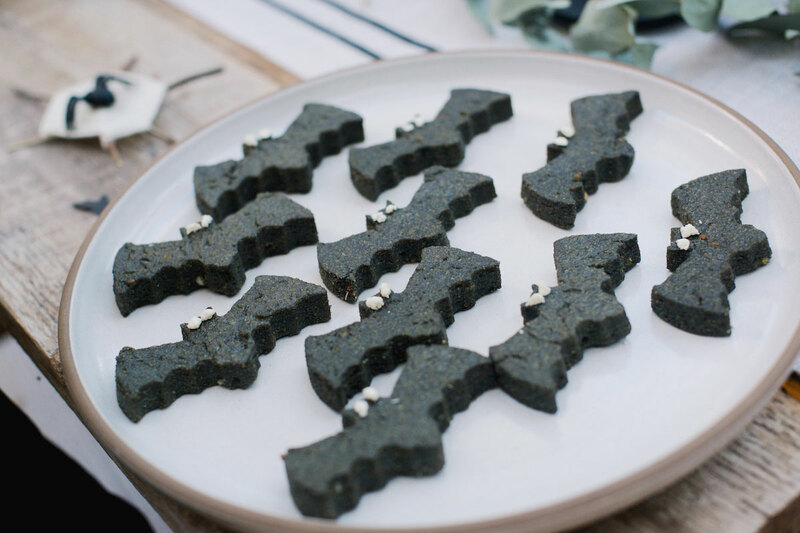 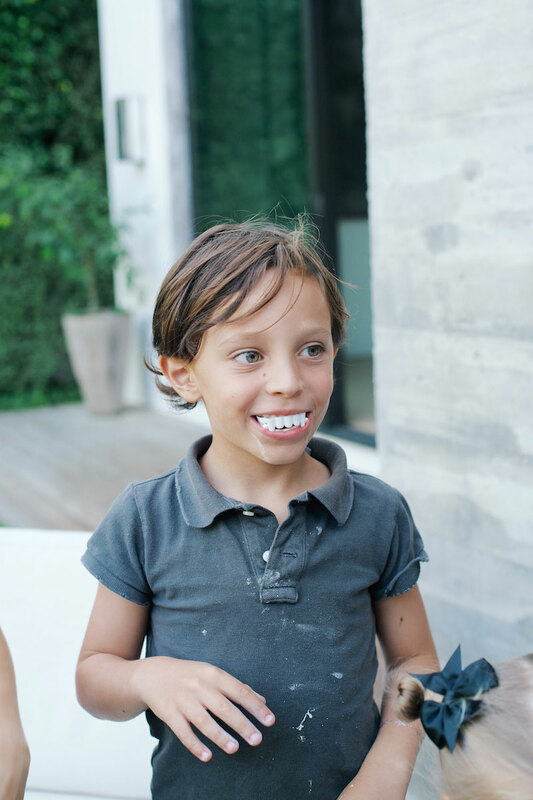 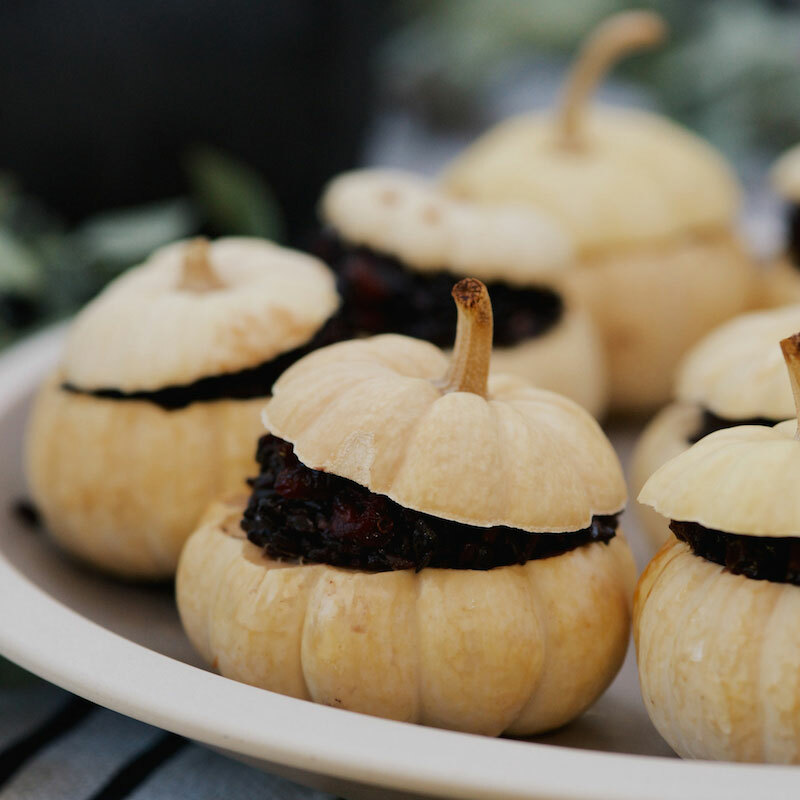 For the Halloween-inspired meal, the lovely Bella created a menu that looked just as great as it tasted, including Bat-Shaped Polenta, Black & White Striped Bow Tie Pasta, Mini Pumpkins Filled with Black Rice, and Turkey Meatballs with tiny olives on top to look like eyes.